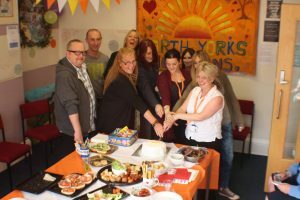 North Yorkshire Horizons clients, volunteers and staff have been celebrating the service’s fourth anniversary with a series of events. North Yorkshire’s free, confidential services have engaged with over 3000 service users since 2014 and have been shortlisted multiple times for national healthcare awards – including winning at the Nursing Times Awards in 2016. The Horizons service is built on a people-centred approach to drug and alcohol support, visiting vulnerable service users in their homes and offering support across a wide rural area. Staff at Scarborough threw a traditional birthday party and invited clients along to mark the anniversary. Colleague Niki Ruff, said: “Everyone had a great time. We had balloons, party hats and birthday banners around the hub. There was a games room open all day – service users were able to play different traditional board games, card games and party games with NYH staff. Events were also held in Selby, Northallerton and Scarborough.